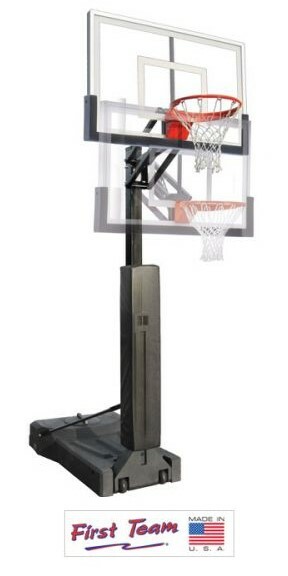 The OmniChamp is an adjustable portable basketball goal designed to provide a higher level of performance than those commonly found at standard retail chain stores, yet it does not carry the hefty price tag associated with gymnasium level units. For use indoors or outdoors the large poly base is designed to hold up to 500 lbs. of sand, making the unit extremely stable. The post is one-piece 4" square 11 gauge, far superior to sectional posts. The cam lever handle located on the front of the base makes one person transport easy on any hard, smooth and level surface. To adjust the OmniChamp to various rim heights, simply release the InstaJust bracket located behind the backboard using a broom handle. The unit easily adjusts from 10' down to 7' in six inch increments. Various backboard sizes and materials are available to choose from. For added safety, a contoured post pad is also available in an array of colors. To dress up your home court, choose First Team's post pad custom lettering option. Because it comes from First Team, you know it's 100% Made In the USA and that means quality. When you are looking for a portable basketball hoop to fit your performance demands that won't break your budget, choose First Team's affordable portable, OmniChamp!